Definitely not as good as I hoped, though not as bad as I feared. Worse. But meh. A fun movie to watch while you’re in there but not the great one we -the audience and the fans- and the characters wanted or deserved. Watchable, entertaining in a way, but not great. Not even good. If you have seen the movie and read/watched the reviews that are going around the internet (or just read/watched the reviews) and/or taken a look at Rotten Tomatoes (which displays a great discrepancy between the critics’ opinion and the general public’s), you will have understood that there is a huge gap in the appreciation it has received. Some people love it, some people hate it. I won’t even pretend to have the right answer for you, truth-seeker roaming the internet in search of, well, the truth. This review is just my opinion about the movie and what I feel towards it. Firstly I will say this -and, oh blasphemy! 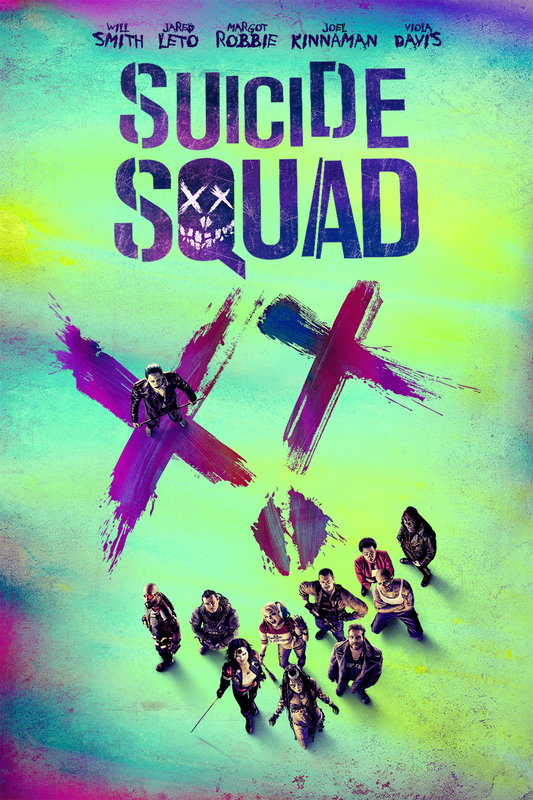 It might shock some people but I care not- I have enjoyed watching Suicide Squad. I went to the cinema not trying to expect anything to great to prevent myself from being too disappointed once it had begun, as I do for any movie that holds some importance to me (I did it for Star Wars VII and for Batman V Superman lately, to name only two). That way I come in, enjoy the experience with as much pleasure as possible and leave the reflection, the thinking and the nitpicking for after the movie. And I must say, that is exactly what happened when I watched Suicide Squad. I went with some friends, had fun in the theater and came out quite excited. I had spent a good moment in there. However I clearly didn’t find the movie perfect. Yes it was fun, but it has flaws. Quite a number actually. And the fact that I found it fun is actually one of them. That movie is so not good but at the same time it’s sort of the perfect no-brain recipe that makes you enjoy it while you are in there the first time. (The fact that I did not try to think, reflect on or criticize it during the viewing helped a lot I believe, although I did relapse and sighed/groaned a few times to be honest.) Well, at least for me. I guess… But once you get out and you actually turn your brain on again and begin to think, it all starts to crumble. Before continuing, let me tell you about the pre-movie period. When they announced Suicide Squad was going to come out as a movie I got a little bit excited but not that much. I’d been reintroduced to the squad a little by watching Arrow, which is a nice show but, once again, not perfect, though very watchable. Deadshot was an important character in season 2 I believe (thought I’m not sure) and was drafted in the creation of a group that was going to become the Suicide Squad. He was cool. Apparently he’s supposed to be a minor character in the whole of the DC universe but, at least in Arrow, he seemed cool. They also teased the presence of a few other characters like Captain Boomerang (or was it an appearance in Flash? I don’t remember very clearly. Have to get back to these shows…) and Harley Quinn, of whom I only remember hearing the laugh and seeing a silhouette (I’ll come back to that a bit later by the way). So, yeah, I was a bit hyped but not that much yet. Things moved up a level for me when the first trailer came out. Of course they had already started their marketing campaign, showing images of filming, giving a few details about the actors and their characters, the first posters, etc. But I hadn’t been paying a lot of attention to that. However, when the trailer came out, that changed. It looked good, dark, gritty, a bit mad and a bit fun. The characters looked good, they seemed to be well-played by the actors too and the plot didn’t seem to be revealed too much (oh how I hate when trailers reveal too much… yes, I’m looking at you Terminator 4 and 5!). Everything was going well. Then they started a heavier marketing of the movie, just before or around the outing of the first real trailer (the other one was a Comic Con thing I think) with more images and facts about the movie, the whole ‘Jared Leto getting too much into character thingy’ and too much info. I saw the thing coming from miles away, in my mind they were going to spoil everything by trying to show us too much, so I dropped under the radar and decided to cut myself off anymore information about the movie until I went to see it apart from the occasional leak I couldn’t manage to get away from. And it went quite well, I only knew about the controversy of Leto’s Joker (if it was going to be worthy of the previous one(s) or not), the full cast and the roles and appearances of all characters (I didn’t know who, actors and character, was in the movie precisely until I saw it) quite late, which I felt good about because it wasn’t anything really important. I have to admit though, Will Smith playing Deadshot? Surprised me at first. I wasn’t really a fan but I got used to the idea, after all, I didn’t know the characters that much, so who was I to judge? Then the movie came out and I saw the whole rift between reviews coming out and got a bit anxious. I started wondering if it was going to be like Man of Steel and Batman V Superman, which I both enjoyed watching quite a lot, and people were going to fight over it? Also if this was going to mark DC’s extended cinematic universe’s end? But, despite a little growing anxiety, I decided to push past it and go see it without so much as reading or watching a single detailed review, just to make my own opinion. Firstly because spoilers!, duh… Secondly because there are quite a number of movies I liked and critics or the audience hated and vice versa. As the days pass I notice it’s score on Rotten Tomatoes go up with audience but down with critics and start to find it fun. Finally I am able to go see it, I’m excited: haven’t been spoiled + in a good mood to see it = usually a good experience. And indeed, it’s fun to watch! But when I come out… meh. I don’t really know exactly why yet (well, I do a little but not enough) but I feel a bit disappointed. So I talk with people I know, I watch and read reviews, from fans of comics and non-fans. And after a couple of weeks (months now) I think I’ve had enough time and information/input to explain how I feel about it. I think it’s partly the same problem as for Fant4stic: it’s an incomplete movie. An unfinished project, almost certainly rushed. “Why?”, I hear you ask. Well first let’s begin by an overview of the good points. The cast is fine, maybe even good. Every actor gives his or her character a good interpretation in my opinion, even Will Smith. Now, now, calm down. I’m not saying he’s a good character, nor that he’s a bad Deadshot, he’s just not the Deadshot that I was hoping for, not completely at least. He’s more Will Smith than Deadshot, if I were to repeat the words of a french Youtuber that reviewed the movie. Margot Robbie plays a crazy, wacky Harley Quinn quite well, although she feels too shallowly for sale to my mind. Viola Davis plays well though Waller is not really dark enough apart from a single moment in the middle of the movie in my opinion. Delevigne plays a good double-sided Dr. Moon and Enchantress, Leto an enjoyable version of the Joker which, in my opinion COULD rival Ledger’s interpretation IF we were to see more of it (I can’t compare to Nicholson’s ’cause I haven’t seen it yet but from what little I have seen in comics and animated films/series and what I’ve played or seen in video game adaptations, it’s quite good). I liked him even if it seemed slightly incomplete or not used enough or not used well enough, still trying to figure that one out. Kinnaman plays a slightly underwhelming Rick Flag, but I don’t blame him, rather the scenario. As for the rest, Jay Hernandez (El Diablo), Adewale Akinnuoye-Agbaje (Killer Croc), Karen Fukuhara (Katana) and Jay Courtney (Cpt. Boomerang), nothing to say about the actors themselves, they act well and played well-enough here, however they weren’t shown/used enough nor to their full potential at all, in my opinion. The music is frickin’ awesome, and that can be said since the first trailer: great music, awesome songs, good, just very good. That ‘House of the Rising Sun’ intro though… From Queen to Credence Clearwater Revival, with some Bee Gees, Rolling Stones and a bit of Ballroom Blitz by Sweet. Nope, nothing to say about the choices (other than, perhaps, the fact that they tried to do it too Guardians-of-the-Galaxy-y and have virtually no original score). Unfortunately, the same cannot be said about the use they made of them, but I’ll come back to it later. The colors, yes. Very colorful, neony thingies. Nice. Offers a contrast with Batman V Superman or Man of Steel, movies which are darker both in storytelling and colorfulness, and that gives an impression/a touch of crazyness to everything, creating (in my opinion) an emphasis on the differences of mindsets in these movies. Dark and realistic vs colorful and crazy. Good idea. The special effects in general, good quality (almost during all the movie, we’ll see that again). Especially that first (second?) appearance of the Enchantress in the conference room! Now for the bad things in the movie. Let’s do this in the same order: actors/characters. Will Smith is a bit too Will Smithy for me. (‘Good man, good father’ type of character. For once, just no.) Not enough Deadshot, he doesn’t wear his mask for most of the movie (in only one scene if I remember correctly, and for a short time), which could pass as fine if he wasn’t that ‘fun witty guy’ all the time. Witty, okay. Fun? Why not. But where is the psychopathic serial contract killer? I don’t dislike the fact that his daughter is his only motivation to do all this, but why not make him a loving father who still kills anyone else out of cold blood? A two-faced character. An example of what I hoped for his character comes in his introduction scene where he is made to shoot all those targets. They give him guns. He points out its crazy and then grabs one and aims it at a guard who was aweful with him all the time he was in prison. He then goes on to say they couldn’t have been crazy enough to give him real bullets, which (I think) Rick Flag confirms and decides not to shoot the guard… Only to realize, once he shoots, almost unintentionally by the way, that the bullets are in fact real. That, added to Smith’s reaction, was a fun moment. But why not do it slightly differently and, when he is aiming at the guard, make him state the gun couldn’t be loaded with real bullets, try shooting at the guard and kill him with a bullet in the head? Cue reaction where he’s surprised at first, says something like “Oops!” and then “Oh no you didn’t just…?” and then point the gun at Flag. Follows a quick standoff with every other guard pointing his gun at him, including Rick Flag, and a quick exchange of wits like Flag saying “Shoot and you die.” and Deadshot replying “I shoot, half of you are dead before I need to reload. Then, I die.” or something. Then he slowly puts his hands in the air and the gun back down on the table before proceeding to pick up another weapon (everyone tenses up again) and he shoots each target with extreme precision multiple times, like in the actual scene. Also nobody cares about the dead guard, especially not Deadshot or Waller. That, or something of the sort, would have been much cooler in my opinion… But eh, what can one do…? Other than that, Smith acts pretty well, it’s just not good for a character like Deadshot. Amanda Waller. Well played but badass/scary (as she is supposed to be) only in the one scene where she kills her assistants in the building. Why not make her like that the whole movie? (Okay, in the restaurant scene at the beginning she was almost good too) And why justify herself to Flag and Deadshot afterwards? She’s f*cking Amada Waller for god’s sake! Enchantress. Three words: Much too powerful. As a villain, they should have chosen someone more ‘beatable’ for a first mission for the Squad. Also, as I said earlier, great intro scene with that hand and the scene flip (wow!) but after that… meh… generic villain. Well played but generic. Except maybe at the end with the darkness/shadow around her and the red eyes, that was cool. Also: her brother and minions: all generic villains made of generic CGI… why? Also, the fact that they create their own villain by letting her roam a little, okay, but why make it so easy for her to escape? Why make her and her brother so powerful with so little consequence? And, seeing hat they did with her, why not wait for the sequel to make her the villain? Captain Boomerang. Basically the go-to guy for the slapstick comedy. Could have been great if he used his boomerangs more (and I’m not even going to mention the stabilized HD camera on his boomerang…) and if he acted a bit like a psycho? Or at least tried to take advantage of others to not die, maybe? (Since, apparently, from what I’ve learned about him, he doesn’t have a death wish like Deadshot, quite the opposite actually… AND he literally does that at the beginning of the movie by convincing ropes-dude [actually Slipknot, but we don’t even see him more than that sadly…] to try to escape to see if the bombs will really blow up…) And finally, that scene where he is saved by his money in his breast pocket… He apparently has a fetish for unicorns (it’s said in his intro) and even has one with him, which he drops and picks up a few times, located inside his jacked right under his breast pocket… It’s cliché but at least using the unicorn to save him, instead of the money, would have made it a lot more fun… OR the money INSIDE the unicorn… And why not make him drunk at a moment in the movie? Since he downed god knows how many beers… So many missed opportunities. Killer Croc. Nice face, bad body. Interesting character, why no backstory? Would have been more interesting than Cpt. Boomerang’s I believe… And why not more presence in the movie? He looks useful at the end, for the bomb (ah, the bomb…) but is not even shown in real action or anything… He is given too little screen time and for what? Lame jokes. I’m sorry but why go all the way and ruin the joke about him being beautiful by explaining it the next lines? Stopping at “Except for him.”, cut to Croc’s smiling face, would have been sufficient and still as funny. El Diablo, same goes for him… Okay, that’s his motto all along the movie but, even so! He could have been used so much better… Good character, nice potential, badly exploited. Too many actual flashbacks, the little fire lady in the glass over his narration of the story would have sufficed, it was emotional enough in itself… And make him snap only at the end, but with a bigger pay off. Not because of Deadshot annoying him. To save his ‘friends’ (or guys he finds ‘not so bad’, ‘a bit fun’ or something), not his ‘new family’… His ‘new family’… God! Not after a 24 hours together, no! Katana. Don’t even know her. Where does she come from? (Apart from Japan?) Why is she there? Why should I cry for her twelve seconds of emotional scene when I don’t even see her in other scenes? Also, powers? No, I know. She’s badass. Her katana steals the souls of the people she kills and her husband’s trapped inside it. She came to help but was late because of… crime, in Japan. But why so little and why so…bad? She could have been exploited a lot more and a lot better… Especially in the final fight: if her katana is supposed to trap the souls of the people she kills, shouldn’t it hurt the bad guy (well, the bad girl’s brother, should I say!) a bit more than just ‘oh I cut your arm’, ‘why yes, you did! Now let me regrow it!’…?! Why doesn’t it trap the soul of the Enchantress? Or the brother? Why is that not an option?! Now, for the rest. If a few short(er) words (I hope). The scenario: too easy. GOD! Faaaaaar too easy! Bad characters with good people’s motivation, more evil character (Waller) with NO visible motivation other than to assemble them and the real bad guy of the story is FAR TOO powerful for them… We, as the audience, and them, as the newly-formed Suicide Squad, needed more time to get to know them, why not a short mission first where se get to know them, see the chemistry between them (and where Katana arrives late, without big consequences) and get used to it (and for them too, to give Diablo time to think of them as friends for example) before the big one, where we could have seen a real bad guy at their level (not an overpowered witch). It could have followed the same basic lines: they do something stupid that ‘creates’ their nemesis and they have to rectify it… Same but different and better, but still same. Now, there are a few good scenes, far too few… Harley/Joker dropping in factory, Deadshot intro with guns (though not as fulfilling as my version), first appearance of enchantress (so cool that hand flip ! :O), Harley in elevator (an attempt at a use of her character that is better than the rest, though very underwhelming compared to what it could have been), Joke at the end (a cool appearance but why, oh god why, in SWAT suit and not stylish tuxedo like always?! ), little lady of fire in diablo’s hand (very emotional in itself but so badly used…). Sorry for the length and the lack of clarity, I had a lot to say and a lot more to add, and it was all a bit confused… Also, yes, it’s been some time since the movie came out but I didn’t have the energy to continue this review okay? I was lost and confused and I wanted nothing to do with it once the initial outrage had filtered out. So, yeah, I finally got to it in the end and tried to make it as clear as possible. I do hope you enjoyed reading me! This entry was tagged movie, movie review, online, review, soar, soar vandergeid, squad, suicide, Suicide Squad, web, writer, writing. Bookmark the permalink.